Bristol born rapper/producer, Tricky, is well known for his involvement in the Wild Bunch and sharing vocal duties on Massive Attackâ€˜s seminal album Blue Lines. After parting ways with Massive Attack, he released his solo album Maxinquaye which was voted the best album of the year by NME. His most recent album Mixed Race was released last year and again looks at breaking down boundaries and borders in societies. 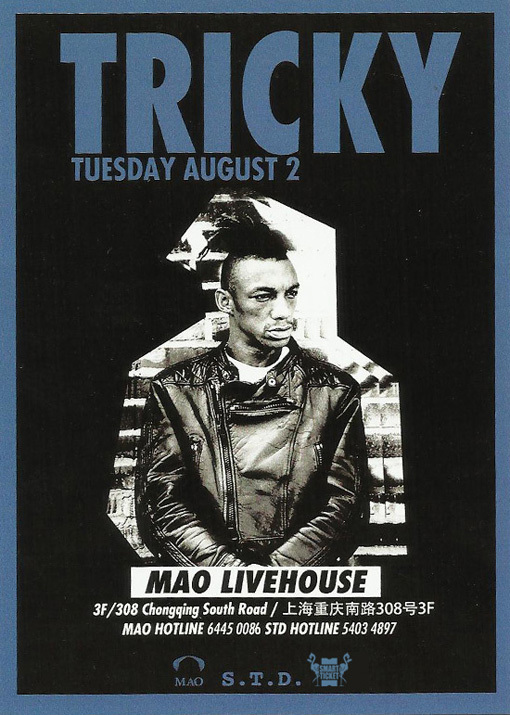 Tricky returns to Shanghai at Mao Livehouse on August 2. Limited pre-sale tickets: 200rmb. Door charge: 260rmb.